Anyway, people usually translate Itadakimasu as “Bon Appetit” or “Let’s eat” (Or in Hokkien “lai lai lai jiak jiak jiak!! !” lolol), which is correct, but doesn’t reflect its true meaning. Itadakimasu is the polite form of “itadaku“, which is the humble form of “morau” , which means “i receive”. Lolol confused yet? Which means, itadakimasu = “i receive with humility”. But receive what? From who? Even if you cook for yourself to eat and you are alone, you say Itadakimasu, because it means “i receive with humility the lives that have sacrifice for me“. It does sound a little morbid if you think about it this way, but the fact is that we human eat other living things, (yes, even if you are a vegan, plants are living things too) and they sacrifice so that we can continue to live. All the love and sincerity, the heart of appreciation, in just one word. I was so overwhelmed i was almost in tears. It is such a great word. We easily take things for granted, but a simple word as such connects our thoughts and prayers back to the nature, and remind us to be always grateful. No wonder Japan is such a beautiful place. Because the people give thanks to the nature at least three times a day hahaha. Try saying your own version of Itadakimasu the next time you have a meal. Maybe it will really taste yummier! So yes, talking about food, would you like some gourmet cherries? Small red and delicious beads kissed by the summer sun. 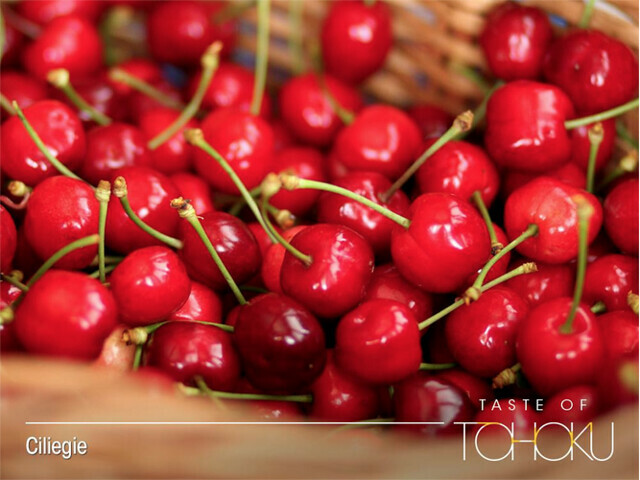 Did you know that 70% of cherry production in Japan comes from Tohoku, Yamagata Prefecture? 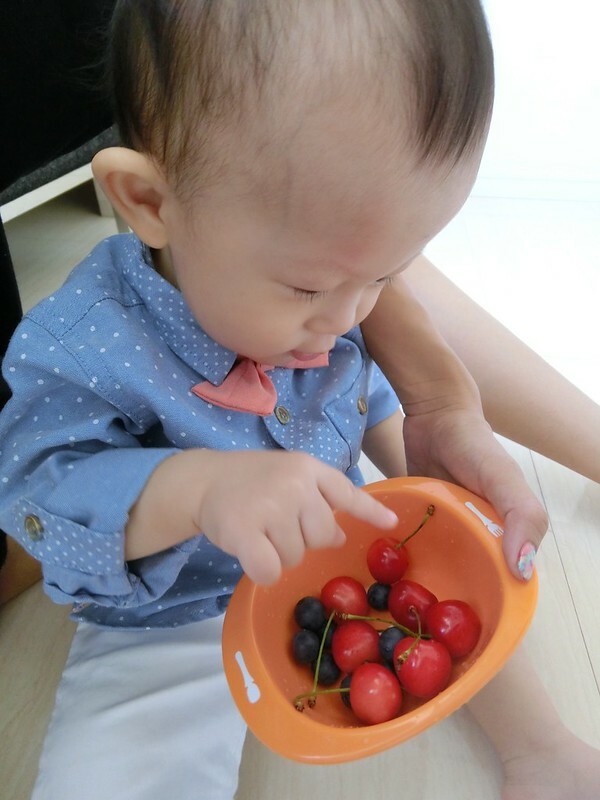 Junya’s snack bowl: blueberries and Yamagata cherries. I’m sure you have heard of Strawberry Picking in Japan, one of the favorite activities to do in winter/spring. But do you know that there’s Cherry Picking (not the fallacy thing) too? I want to do this one day with Junya!! 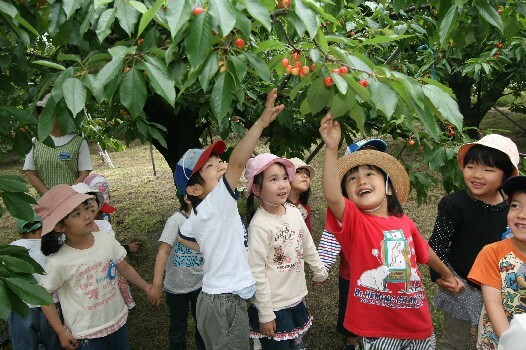 During the months of May-July, you can go to cherry farms to pick cherries and eat them fresh off the cherry trees! It costs usually around 1500 yen to 3000 yen, depending on the grade of the cherries. And usually you get to eat all the cherries to your heart’s content within 30 minutes. Worth it!!!! Speaking of grade, Japan probably produces the most expensive cherries in the world (along with many other fruits like melon, strawberries, grapes, apples, just to name a few)! One of the most expensive cherries is called Charmy-Cherry (Sato-Nishiki type), produced in Akita prefecture. You can find it in most high-end departmental stores or luxurious fruit store like Senbikiya. Apparently it can go up to 25000 yen (RM700+) a box!! These beautiful cherries are flawless. They are carefully selected and sometimes put in a box individually like this. Why are Japanese fruits so expensive? They are not always expensive. 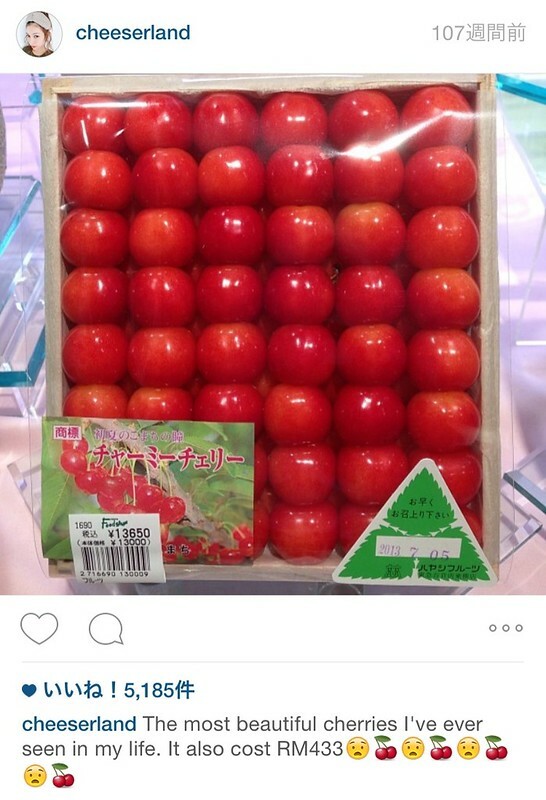 I usually buy my Yamagata cherries for like 500 yen (RM15) a box. But yes, the top grade fruits can be insanely expensive. And why is it so? 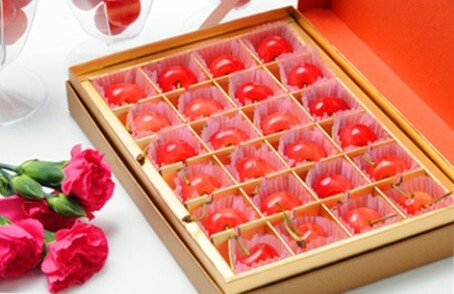 Gift giving is an essential part of the Japanese culture, and fruits happen to be one of the most popular gifts for friends, business associates, etc. The more high end it is the more unique a gift it will be as so to impress the person you are giving to. That is what makes the farmers go to extremes to push the limits of the quality of their fruits, the taste, the color, the presentation and even the shape (heart shape melon!!!). If you watch the documentaries on Japanese fruit farmers, you can see how much love they have for these fruits. So yes, next time you are in Japan, make sure you splurge on one of these love-filled beautiful fruits. Beautiful post about a beautiful thing! Even though I do say itadakimasu a lot, especially when I’m in Japan or with my Japanese friends (I also say it quietly to myself when I dine with others or by myself lol) I’ve been thinking about the meaning behind it quite a lot, even before I knew the word. As a child, I often thought about the mackerel that once swam in the sea, and how I wish I could show him respect for him sacrificing his life for my dinner. It was the least I could do. No, I’m not vegetarian but I have considered it a few times in my life, but as a biologist I know humans are also a natural part of the food chain. I do love all animals though, and appreciate the produce the farmers have worked so hard for to give us. I definitely think western society could learn a thing or two from this Japanese saying, as so many of us take the food on our plate for granted without thinking about where it came from. But thank you. You have no idea how happy i am knowing that many people like you appreciate it too!! I’ve read this in a book before! Simply love Japanese language. It’s like they’re not just plain words. There’s a part that wrote about おはよう too! Yea i learnt about Konnichiwa too! It’s all really interesting!! Hope i can find the book! 🙂 I’ll go Rakuten and find now! Thank you for sharing the real meaning of “Itadakimasu”. When we were in Japan, we truly felt the lives behind each little thing. I even said to my husband that I finally understand why the Japanese spend so much time to make everything perfect. It’s about the respect they have for each little thing, to make each object shine by its own right. I love it when you write about Japan and its culture. 🙂 Thank you!!! Thank you for putting my thoughts into words!!! Yes their perfection is sometimes so exaggerated that sometime i feel it’s almost unnecessary. But you are absolutely right. And thank you for sharing too. I learnt that it meant “i gratefully partake” when i read Totto-chan, the little girl at the window by Tetsuko Kuroyanagi. I don’t know if you’ve read the book before, but i think you’d enjoy it! 🙂 thank you for the posts on Japan, it’s great insight into Japan and japanese culture. That is very special and humble. It’s always so cool to find out the relevance of something you hadn’t known before. It is similar to we, Christians, say grace, which is thanking and honoring God before every meal. We give thanks to God for providing it to nourish our bodies, the ones who prepared the service, the partakers of the meal, and whatever else people want to glorify Him for at the moment. We bow our heads, sometimes clasps our hands in the prayer stance like in your photo, or sometimes join hands with others at the meal then say grace. It usually ends with “in Jesus’name, Amen.” Not everyone says grace all of the time, but it is a recognition to God. Thanks for sharing. Thanks for the explanation! I love this article very much. I knew the meaning of “Itadakimasu” as “Tuck in” before this and it’s kinda mind-blowing after reading your words. Didn’t know there’s such a deep meaning behind it.